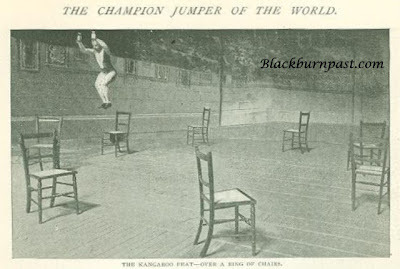 The above Pathe link is a short, silent clip from 1927 of the legendary Blackburn born John 'Jack' Higgins, world champion (his own claim I think) jumper. He was 54 years of age when this was filmed. It is documented that he could actually leap across the canal, touching the surface of the water with one foot. When he was aged 55, he jumped over a horse & cab (with the aid of a small table at one side) in the New Princes Theatre, here in Blackburn. 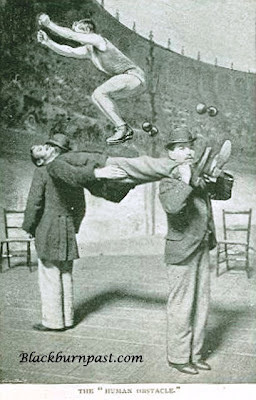 His stunts included jumping in and out of a series of washtubs, each spaced three yards apart and the snuffing of the candles trick, as seen in the film clip. While performing in San Francisco he cleared two horses 17 hands high and in 1895 he jumped over 45 chairs in succession, placed in a ring, with each chair ten feet from the other (must have been in a huge circus ring). A remarkable athlete, in any century. Not a tall man, he was less than 5'4'' in height. 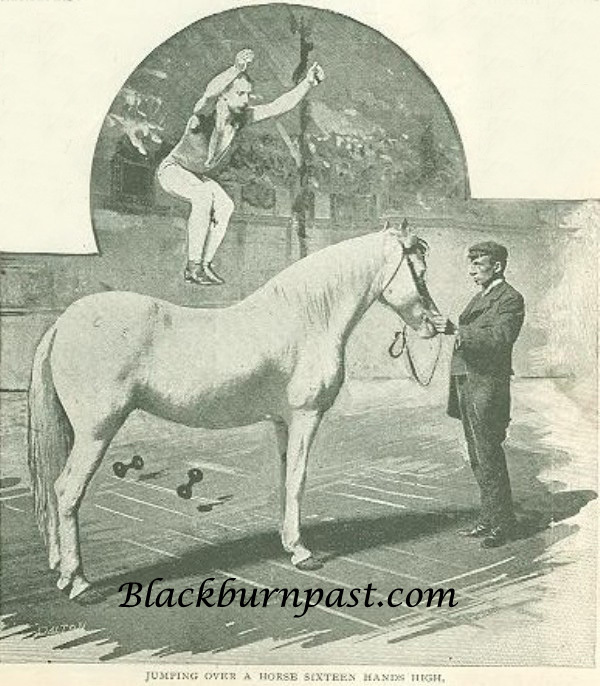 Jack was born in the King Street area of the town, circa 1871 and found fame for his feats in the early 1890's, when he was around 18 years old. He toured the circuses and theatres in the UK, making a career for himself and as the film clip above is French, he probably toured on the continent as well. He also went on a 25,000 mile tour of America giving performances. He used hand held weights to gain a little extra momentum, dropping them at a precise moment (a bit dangerous for his assistants I would have thought) in mid flight. This can clearly be seen in the Pathe clip. Mr Higgins found fame in his lifetime and is still a legend, especially in Blackburn, but sadly he didn't find fortune. It is said he died penniless in the late 1940's. Below are four more images of Jack in action. These date from 1897, when he would have been 26 years old. They are all from the same performance at the Pavilion Theatre , Piccadilly Circus , London. TOP PHOTO COURTESY OF ERIC LEAVER / LET. BOTTOM PHOTOS COURTESY OF THE CP COLLECTION. INFO COURTESY OF THE CP COLLECTION AND VARIOUS SOURCES. THE LINK BELONGS TO PATHE NEWS. I have researched his life, and have made contact with his grandson, who still lives in the area. One fact escapes me. It is widely reported that he died penniless in the late 1940's, possibly in Detroit. I am not sure about this, and cannot find out any info on his death. Can anyone help? Coincidentally, both my mother and I attended Notre Dame. She was Joan Hall, one time Mayoress of Blackburn when Sarah Buckley was Mayor. 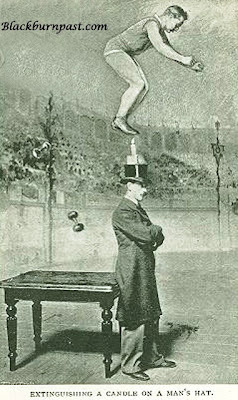 Is there any way you could tell us about how he trained to do these great feats? Hi, Thank You for your comment. I know very little about John Higgins. I have just seen the odd photo in local history books and a couple of months ago, I bought a few pages from The Strand magazine that were on ebay. They date from an issue that was published in 1897. That's were the above images are from. I have now found info on his death. He died in performers digs in the 1930's in London. He is commemorated on a Variety Artistes memorial in a London graveyard.